Sherri Soukoroff started making tiles in1994, after studying at the Emily Carr Institute. 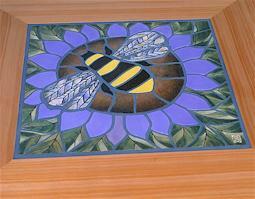 Originally a painter; Soukoroff treats her tile-inlays and murals as a canvas. The tiles are handmade of earthenware, handpainted in a range of vibrant colours. The designs are drawn onto a slab of wet clay, the individual tiles are then cut out, dried and painted. The tiles are then bisque and glaze fired and ready for installation. Sherri Soukoroff and Michael Petersen, furniture designer, together have created a series of tile-inlaid tables. The tables are available at Indigo Road in Nelson. Soukoroff also does custom and commission pieces as well as accent tiles ready for installation.